The tilt and turn range features a dual opening mechanism for security, safety and practicality. By twisting the handle to 90 degrees, the sash tilts inwards to provide gentle ventilation: when turned to 180 degrees the side hinges engage to enable the window to be fully opened for ease of cleaning or fire escape. At Countryside Windows, we serve customers all over the South West of England with tilt and turn windows for their homes and offices. These type of windows provide a simple, but contemporary and elegant solution which is suited to a range properties, both modern and older. They are constructed from long lasting aluminium and feature a dual opening mechanism. This means that they can be fully turned, if wanted, in order to make the window open on its hinges. Alternatively, they can be tilted, thus allowing for air to flow inwards but denying unauthorised access. As such, our tilt and turn range of windows afford a great deal of security, safety and sheer practicality. One of the advantages of the range is that they offer the benefit of noise reduction. Not only does the glazing help to prevent unwanted sounds from outside, like road noise, but the frame cuts out extraneous noise, too. The products are also low maintenance, meaning that once they are installed they need little or nothing done to them in order to ensure a long life. The casement structure is of the highest quality that can last for decades. They are also incredibly safe windows to choose, as well. Because the turn function of the window allows it to be moved entirely into the property where it is installed, wiping down the external glass becomes child’s play. There is no longer any need to climb up ladders to clean the windows or to lean out of the window in order to reach all parts of the external glazing. Simply turn the window inwards where it can be cleaned with ease. The tilt and turn windows we make are able to be sized for any type of aperture and used for new build projects or to replace existing windows. 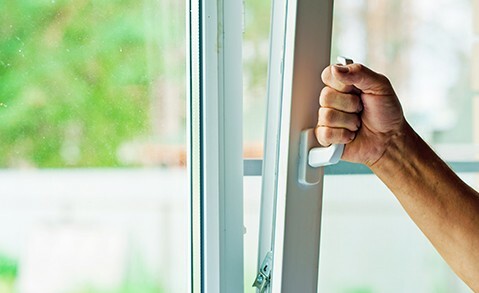 Once installed, they are incredibly secure with high quality latches and locks which mean that – even when the window is set to its tilted position – tampering with the security mechanism is virtually impossible. The aluminium frames are tough but look superb and can be painted in a wide range of colours, or powder coated, depending on the preference of the customer or to fit in with an existing colour scheme. Lastly, it is worth mentioning that this range of products on offer from Countryside Windows is thermally efficient and traps heat inside a building, thus helping to reduce utility bills over time.